The Associated Press distributed a ‘Pressure Cooker Redeems Itself’ story before the Boston bombings, which some readers found "offensive." 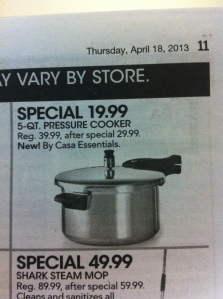 The Cape Cod Times also apologizes for a Macy's pressure cooker ad that was placed next to a bombing story. What does this really have to do with advertising or merely using the term "pressure cooker" on a newspaper page? Dunno. A few people a bit over-sensitive during an awful turn of events this past week? Maybe. Anyway, you be the judge here.